Pure and fresh arctic moisture travels thousands of miles on the trade winds to Hawaii, the most isolated land mass on earth. Converted to bountiful rain or snow as it hits the slopes of Mauna Loa, the water percolates through nature's ideal filter - 13,000 feet of newly formed porous lava. From rainfall to bottle in about 30 days, the short journey of this young water allows it to be naturally alkaline with a pH of 7.7, while maintaining a low mineral content of 91 TDS (Total Dissolved Solids). The taste has been described as fresh, smooth with a hint of natural sweetness by consumers. 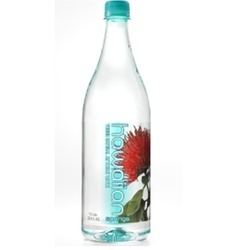 The mountains of the Big Island of Hawaii create a virtually inexhaustible source by capturing almost 200 inches of rain per year, making the aquifer one of the most renewable sources of water on earth.The labels of the packaging feature three endemic Hawaiian flowers - the Ko'oloa 'ula, the Nanu and the 'Ohia Lehua. The Ko'oloa 'ula is sometimes known as the Red Llima or The Flowering Maple and both it and the Nanu are endangered. The 'Ohia Lehua is an essential food source for endangered Hawaiian birds, and is the signature flower of the Big Island, home to the source. Hawaiian Springs gives to the Nature Conservancy in Hawaii and partners with other organizations like the Plant Extinction Prevention Program in preserving Hawaii's unique environment.